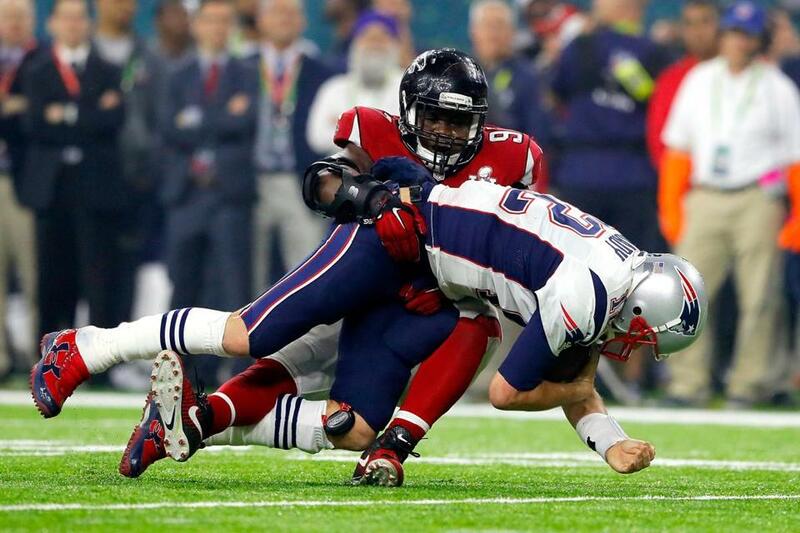 Grady Jarrett sacks Tom Brady during the fourth quarter of Super Bowl LI in Houston. To help address its concussion crisis, the NFL issued a rule in 2013 banning players from making hits with the top of their heads. A new study finds that, compared with the 2012-13 season, the 2013-14 season did indeed see about one-third fewer concussion reports for the defensive positions typically involved in these collisions. However, because these players became more focused on lower-body tackles, and their opponents had to do more fancy footwork, there were about one-third more reports of lower-body injuries for the offensive positions typically involved in these collisions. These injuries were also more severe, resulting in more games missed. The authors of the study calculate (with some caveats) that the rule imposed a net cost, not a net benefit, on players. Hanson, A. et al., “Safety Regulation in Professional Football: Empirical Evidence of Intended and Unintended Consequences,” Journal of Health Economics (forthcoming). Nie, F. & Olson, D., “Demonic Influence: The Negative Mental Health Effects of Belief in Demons,” Journal for the Scientific Study of Religion (forthcoming). We often assume that people don’t want to hear the same old story. But psychologists at Harvard and the University of Virginia wondered if people “worry too much about boring their listeners and not enough about confusing them, and that they therefore tell novel stories to listeners who would have enjoyed hearing familiar stories a great deal more.” This was confirmed in several experiments. People expected listeners to enjoy hearing commentary about a video the listeners hadn’t seen more than commentary about a video they had seen, but the listeners actually preferred hearing about a familiar video. This is because a commentary inevitably leaves things out, which impairs a listener’s enjoyment more than familiarity does. Cooney, G. et al., “The Novelty Penalty: Why Do People Like Talking About New Experiences but Hearing About Old Ones?” Psychological Science (forthcoming). In experiments at the University of California Berkeley and the University of Illinois, researchers found that two people got along better — whether in conversations or joint tasks, whether assessed by participants or observers — if they were both poor or both rich, as measured by parental income or subjective socioeconomic status, than if they were both middle class. The researchers theorize that it’s easier for people at the extremes to relate to each other, especially in a society where inequality is salient. Côté, S. et al., “Social Affiliation in Same-Class and Cross-Class Interactions,” Journal of Experimental Psychology: General (February 2017). Researchers scanned the brains of MBA students while they watched the same set of videos (including comedy, debate, and documentary clips) and found that those who considered each other friends exhibited a more similar pattern of brain activity, even controlling for other factors. Parkinson, C. et al., “Neural Homophily: Similar Neural Responses Predict Friendship,” Dartmouth College (December 2016).